I had such a great time in Illinois. And when I lost my cell phone, my twitter friends found it! Have talked to some people about joining some collaborations and accomplished quite a bit. I take one page in my conference notebook (usually the last one) and write at the top "My Big Three" -- then at EACH session I attend, I write the three things I will do within the next 7 days. This gives me one page of action items to do. Although my notes are great, I rarely go back and read them. When I get back, I tear out the page and put the items on my planner or tack it up on my bulletin board. I can clearly look and prioritize then when I see the trends that emerge. I believe that teachers must reinvent themselves and continually keep themselves abreast of "what's new." We must move past point and click teaching and help people become self-directed learners. So, this is a list of what I want to do "when I get a chance." I keep an intentional R&D list in my planner and go to it when I have a chance. OK, gotta go - battery is dying and no AC! Just came across happy happy apple's post on the new Google Android platform for cell phones. This new operating system for cellular telephones seems fascinating. My cell phone is MIA (missing in action). Stolen, lost -- who knows. I figured it out last night and my husband called the carrier this morning. As a former General manager in the cell phone business, I've NEVER lost my cell phone. And I'm pondering -- not just which is the best gadget for TODAY! What will I be able to download this android software onto and use? What is expandable? I think it is less about NOW but more about -- how mashable is it? And iPhone lovers -- I wish I could have an I-phone but AT&T service in south Georgia is as inconsistent as a bass trying to sing a Freddy Mercury ballad. However, after looking at the Android site -- it says it won't work on any phone!? So, I guess that means I need to have a Windows OS on my phone? So, my amazing friends... what does an expandable phone look like? One I can add too and download apps on. I really think that is more important than having the best today. Can I mash it up? Will it be flexible for the future? This week I'm in Illinois at their amazing technology educators conference. I had a delightful dinner with Lucy Gray, Dean Shavit and others. If all of the technical things work out, I will be ustreaming today. View the video and audio at my ustream channel. I am on central standard time in the USA. 10:00 am - 12:30 pm CST- Wiki Workshop - Ask to join the wiki if you want to collaborate with us, just let me know who you are and where you are. See all of the resources on my wiki. 10:45 am - 11:30 am CST - Cool Cat Teacher's Wonderful World of Web 2 Teaching I will post slides tomorrow. I hope you'll join us! The people here are just GREAT and it is going to be a wonderful day! These two things are really kissing cousins. The backchannel has really become my favorite tool of choice when I'm presenting. I've purchased an inexpensive ad-free chat room at Chatzy that is password protected and use it for my backchannels when I present. I like to find two people to help: one to serve as Google Jockey (a/k/a Link dropper) and another to serve as a moderator -- posing questions to me when I take a breath and ask. Gomeric Hill talked about the backchannel on a blog post. "The WebEx interface they were using to present Vicki’s Flat Classroom project has a chat that was used throughout her presentation as a backchannel discussion. As Vicki talked, the conversation in the chat replied to her, responded to her, posted questions for her and assisted with answering questions without Vicki’s help. Sometimes the chat updated slowly and at other times, the information was being added so quickly it was hard to keep up with the glut of information being added to the chat. I learned as much from the backchannel discussion as I did from Vicki..."
1) It demonstrates HOW things are happening now. A viral mashup of services, stream of activity and happy accidents. 2) It also demonstrates the power of the backchannel. I personally believe that the backchannel is the greatest unharnessed resource that we as educators have available to us. It does not threaten me nor bother me that you learned as much if not more from the backchannel the other night -- in fact, it makes me feel great that I facilitated the connection. I believe a good presenter pushes the backchannel to do more by asking questions of it, encouraging the backchannel to communicate and share, and prodding it to communicate about the topic at hand. I wonder if it is the "sage on the stage" type environment we've all grown up in that makes us THINK that the best thing on the menu should be the "main course" -- the presenter. When, in fact, the backchannel has so many more people involved -- really, it should give the most resources and insights and just add to what the presenter is saying. Of course, there is backchannel netiquette as we discussed, however, I thought the backchannel was phenomenal. These are RSS feeds or searches enabled by the use of a twitter search engine like Terraminds -- searching on a keyword. See what this looks like at the Terraminds @bookgroup search -- so to make this simple -- it is aggregating all of the people discussing the book and we didn't really have to do anything except just create a wiki. @digitalmaverick is the bookgroup mastermind and it is starting to take shape. 1) What if some teachers coordinated a group skype discussion and enabled a backchannel chat with their students between the classes? 2) What if we came up with a twitter group for the major pieces of literature and set up a wiki page for each of them -- we could aggregate the thoughts of students and they could even send thoughts to it from their cell phones? 3) What if we just came up with a few standards of keywords to use for books or events or just about anything to aggregate the thoughts of students or teachers. I'm trying this out -- if you'll go to your twitter account and type in #cw2 and then put a cool web 2 website, we should be able to follow the RSS feed for this at - http://terraminds.com/twitter/query?query=%23cw2&submit=search+in+updates once it populates. Just think about what happens when we connect. Let's use our minds here and we can really come up with some useful ways to give more students a global audience without inundating us all with too much. OK, everyone. I think I sense in twitter a little Monday dread coming on, so perhaps we need another Funday Monday. This one is from Wavelength -- a great professional development drama troupe for teachers -- I saw them in Atlanta a few years a go. They are hilarious. And remember -- always greet your students and call them by name when they enter -- I believe this is important. I make eye contact with every student as they enter -- I like to stand at the door and do this. This video is a humorous reminder. We don't need any mutant teachers out there. Sorry for the blatant move away from education, but hey, the tension is killing me and we need a laugh sometimes. I'll be heading up to Illinois this Wednesday -- hope to see some of you there. While playing with Newspond, I came across information on the wireless protocol that is going to turn your student's cell phone into more of a computing workhorse than ever. Can you say, streaming HD? They believe this will make it possible for us to live streaming HD wirelessly as well as a virtual connection to a docking station that would let your laptop display on multiple displays AND access non-internal hard drive storage. The article says it won't be here until 2009 but the target price for this chip is $10 -- yes, $10 which it means it can be in pretty much anything. No longer just fuzzy recordings to youtube (see Spies Like Us), kids will be able to live stream from cell phone to HD tv's around the world. We need to fully discuss and integrate digital citizenship at all levels. I think the reasons we're having so many problems with cyberbullying, hacking, and other behaviors, is because most schools largely ignore technology and relegate it to the "computer teacher's job." As cell phones, computers, digital paper, and even computing surfaces integrate fully with our lives, we will see that these are part of everything we do and should indeed be a part of every subject. And, remember, I don't advocate gadgets for the sake of gadgets (See Washington Post Article - Too High on Gizmos) -- more gadgets don't always mean better grades. I'm sure that my miniscule $25,000 technology budget makes my vendors snicker behind my back. (That includes everything from internet connection to antivirus renewals.) However, it is the connection with the world that makes our program world class, not the hardware. Hardware (and to some extent software) is becoming a commodity. Increasingly, its presence does not guarantee that a school will be "leading edge." It is the USE of technology that determines the success of a school and the future success of its students. We need to work on behavior and bring these tools out of the bathrooms and closets and pockets where kids can literally text without our knowledge. Let's teach their effective use and also teach and promote self control. I think it is time to start harnessing these tools. I don't have all the answers and we still "ban" cell phones and ipods in all places but my classroom, but I keep thinking that we've got to get to a more stable, workable solution with these little "monsters." I came across this twitter from @kolson29 -- a great video from an elementary teacher. This is a great video! Kudos, kudos! I came across a cool post about 13 online alternatives to PowerPoint and decided to play with PreZENt it! I made a slideshow and then shared what I learned. I WISH I could embed the show into this blog post, but it seems that feature isn't enabled. Just remember, if you're ONLY teaching powerpoint, you're missing it. PowerPoint is great, but it is likely that students will have to change software programs as often as they change their hairstyles over their lifetimes. Fluency is technology is very important as students will have to be able to move from not only job to job but platform to platform. Get out there and expose your students to more! I've given several presentations lately and, although I'm posting these on my personal wiki, I thought some of you would like to see the slides. This was given last night at the Discovery Educators presentation. If you want to hear Julie Lindsay and I present the first part of this, I have an elluminate recording from today when she and I presented to some teachers in North Carolina. You'll hear Julie and I talk about this year's Flat Classroom project structure, organization, and methods. You can see all of my slideshows on slideshare - http://www.slideshare.net/coolcatteacher/slideshows. I've been reworking all of my presentations (and changing how I teach presentations), based upon Garr Reynolds' amazing book Presentation Zen: Simple Ideas on Presentation Design and Delivery (Voices That Matter) . Don't be put off by how many slides some of my presentations have, it is more slides, less talking, actually. Think of it as if you're a live narrator for a documentary! If you look at my presentation from last Tuesday at the Center for Quality Teaching and Learning, the first 14 slides literally take 1 minute and 20 seconds. I did them for my students as a demonstration -- and they agreed it is a much better way to present, although it is very different! Garr talks about not producing "sliduments" but have a "document" to hand out. Demonstrate the technique -- I have my students time my intro of myself and ask them to guess how many slides I use. Elicit emotion with at least one slide - I end the presentation with my picture of the shark (slide #14). We talk about the principle of thirds, share lots of examples, talk about Contrast, Repetition, Alignment, and Proximity, and just look at a lot of Garr's work. We also talk about full bleeding off of the page. We discuss scripting and storyboarding. THEN, they go into PowerPoint -- not before! You can imagine -- right now my walls have sticky notes ALL OVER THEM! But, we're getting some great presentations for me to share with you next week! I wish there was a way to easily mark or delineate the slides I can give you and those that are the copyrighted pictures... that is the struggle with these things! I've been on "vacation" for the last four days but with a sick daughter, messy house, and a beebee gun to the back windowshield of my vehicle -- I've been feeling more like a human "doing" than a human "being." I came across KWHobbes' great article about "Functioning in a state of overload." He's a father of 7 so I feel that he can identify with my all too constant state of rush rush. can you image what other educators who weren’t using technology would feel like if this were thrust upon them, even a bit at a time. With the number different things that are coming at educators from all sides, an overload of information is not what they need. So how does one manage in this time of information overload and do more than just skimming and scanning or drown in the tsanumi?" A favorite saying of my late grandmother. Perfection is an illusion. It is enough to be joining in the conversation. And remember that ALL OF US, especially me feel "out of it." Change what you can and start at home. Yesterday, my daughter and I had a great photography lesson together as we learned about how to take photographs. You can see what our last photo to the left. We had a great time! I have a whole chapter about this in my new book -- I keep a list of things I want to try out and when I can sneak in a little time here and there, I don't mindlessly surf -- I intentionally spend time on my own research and development in ways that fit into the big picture of my life at the moment. R&D is literally a list in my planner! It is easy to feel like that you'll "miss something" when twitter is abuzz and things are hopping in the edublogosphere. Guess what? Things are always hopping in those places. Automate as much as you can to facilitate your sharing. Calendar Magic - I know everyone loves Google Calendar, but my life is on Airset -- this tool is embedded into so many things I do, from updating my public calendar on the left hand side of my blog, to reminding guests when they are coming on wow2, to setting up appointments, I love airset. Additionally, I use callwave for my cell phone voice mail now, if I miss a call, callwave records the message and forwards it to my e-mail with a pretty good transcription and a copy of the message that I may listen to from my computer. I just use that for everything and am about to set my home phone to no answer transfer to my cell phone -- I need ONE place to check everything -- gmail is it -- even my voice mail. E-mail Magic - All of your e-mail accounts can be set to go into one gmail account under your account settings. (It checks pop and imap e-mail.) I set all of it to go there. If you have gmail, all I can say is filter, filter, filter. I have several important folders set up -- one is 2READ -- I filter all of my newsletters, etc. to go directly to that folder and skip my main inbox. Mark things as spam and filter them. If you don't want them, just tell gmail to delete it automatically by pressing the little down arrow on the right hand side and select filter messages like this. I still get 100 messages a day -- but that is down from the 2000 or so that I was getting since I went to gmail. It has the best spam filter and although I miss outlook a little, I have got to have the spam filter! Use folders - I use the Getting Things Done: The Art of Stress-Free Productivity method by David Allen and have folders marked @ACTION and @WAITING to file my e-mails that I need to act on or am waiting for others -- I still have to go through and review, but it is important to be able to get that inbox down to zero. 6) It is ok to be a being and not always be doing! The hardest thing for me to remember is that I am not validated by my list. Relaxing and remembering that I have a family to love on that won't be here forever is very important. I'd love to know your tips for being more efficient. Please, share! Jeremiah over at Wet Strategist has a great post he's doing explaining to businesses about Social Media. Part 1 is what to do with negative comments and part 2 is about authenticity and transparency. These are two things I discuss at length with my students and I thought I'd share them with you! What do you do with negative comments? I have found that people want to be heard, but sometimes see the bad behavior on political blogs or unmoderated forums and think it is OK to behave in such a way. I am an educator and it is my job to educate. I will not publish, I will rephrase. Recently, someone accused me privately of not publishing their comment. As I told them, I publish all related (non spam) comments 100% of the time. If it contains profanity, I will rephrase. But I believe for my authenticity to be "real," that I should welcome dissent. If they take the time to dissent, I should take the time to respond - I think it is good practice for bloggers to comment on their own blogs and I do it all of the time! If it is shameless self promotion and not related to my blog, I will not publish it. There is a fine line here, however, it is usually very obvious when someone is just trying to get a link from me. When the link is not educationally related, it is an easy decision. Sometimes conversations move from my blog to other places -- like most bloggers, I consider it a compliment to be quoted and to have someone add their thoughts to mine. It is very important to use something like statcounter (which I prefer over Google Analytics -- I have both) or a technorati watchlist to see what people are linking to on my own blog. I particularly look for those bloggers who are just starting out with no authority level on Technorati. (That means no one has linked to them) As an educational blogger, I believe it should be part of our ethos to encourage newcomers, to provide positive reinforcement for the fact that they wrote, hyperlinked, and pinged technorati, and to encourage them to continue. We should be authentically interested in others and not just do it for links or any gain. I always remember the people who were kind to me and commented, linked or encouraged me when I was just starting out: David Warlick, Karyn Romeis, Doug Johnson, Stephen Downes, Jennifer Wagner, Ewan McIntosh, Jo McLeay, Darren Kuropatwa, Mike Hetherington and so many more. What does it mean to be authentic, transparent, or human? "Things are different now, the internet allows for real people to connect with other real people and have discussions about anything that interests them –void of any shield, crest, or banner. Well to be specific, some people start creating their own individual brands (we see this on many blogs), but it’s at the core individual level." It is so much about VOICE. Students draw a colored chip (I use poker chips to do this) -- Each chip has a character -- I use Davy Jones, Will Turner, and the sailors on the ship as my three choices. I show the Kraken attack from Pirates of the Carribean. I teach my students how to embed the video into their blog. (We use a private ning now.) I also talk about HTMl and what it is. Then, I have them write AS THAT PERSON. After we're done, we talk about VOICE. Emotion. Imagery. Feeling, and what makes a good blog post. Here is one example of an eighth grade piece that was done. And remember this, the student was writing for me IN COMPUTER CLASS. "There is one monster of the sea. Will Turner may he be cursed!!!!!!!!!!!!!!! A beautiful woman broke my heart. OH HOW I LOVED HER!!!!! URSE EVERYONE THAT HAS ANYTHING TO DO WITH LOVE!!!!!!!!!!!! Maybe love is the real monster after all"
After we do this lesson, it is easy for them to understand that they are to write with a voice, only the voice is their own. It is that personal, unique voice that distinguishes the blogger from the separated, objective journalist. Yes, the blogger can report, but first person is very often what we do. Our blog is who we ARE. Often, my own mistakes provide useful lessons to others. SUre, it is humbling to share such mistakes as my own falling for the Microsoft Firefox parody, or sharing when my son drafted a 9/11 report citing only a conspiracy website as his primary source. If you follow the threads on these two examples, you'll see that I had to endure what happens to most people when they screw up -- people jump in and tell you how "dumb you are." Well, in this world where we are all beginners, we have to work on making it a place welcoming beginners. I leave up my own mistakes and use them as learning examples for others. And if I ever get "too big for my britches," one look back at those two examples gives me a humility antidote to last a few more months. It is OK to make mistakes. Make them, correct your mistakes, and learn from them. Don't hesitate to correct what you've done wrong by using a strikethrough to mark out the wrong parts or by commenting on the post. Just remember, don't change the page the post is on, or everyone loses where to find it and all of your "backlinks" will disappear. Making mistakes is OK as long as you are a real human. Now, if your purpose is to look like you know everything, then you could delete your mistakes and all of the comments, but then, I guess, you would no longer be real, but rather, A FAKE! All humans make mistakes! #7 It is OK to be an individual "brand"
Some like to change their names on each site, however, I tend to stick to coolcatteacher. It is almost like a fourth name I have now and I'm OK with it. However, if I have something I want to blog that doesn't "fit" with the audience for this blog, then I just create another blog for that. Know who you are on each blog. Be who you are. But remember, you may have several aspects of your personality that don't fit in the same blog -- feel free to create another "brand" for that area of your life. Again, this is why we teach blogging AND essay writing at our school. They are two different means of communications. Sure, you can write an essay and post it on a blog or vice versa, however, having a successful blog is a different skill. That is why I teach these things as well as my 10 Habits of Bloggers that Win and How to Comment Like a King (or Queen) as part of what I teach. All of my students have an assortment of public, semi-private, and private blogging spaces. This is part of who they are and their future. Understanding transparency and voice seems to be so difficult for many (especially business) who have tightly held their communications in the grasp of their PR departments. Blogging requires letting go of control, something schools and business seem to have a tough time with. StumbleUpon - I've been refamiliarizing myself with this old favorite lately. They've done a few things to make it more usable. I find it a great way to find new "stuff." Kerpoof - I've got to play with this tool. There are a lot of educators singing Kerpoof's praises right now! I've got a lot of work to do on the upcoming Horizon Project and a digital citizenship class that Julie Lindsay and friends and I are working on. Oh, and I'm excited about being on EdTechConnect this upcoming Wednesday night -- it is a free seminar that you may register for now. I've got some exciting material to share about the steps to "flatten your classroom" and some other things as well. I'm recruiting a few "backchannel moderators" so comment or twitter me if you're interested! I'm just now buying the Twitter Book Group's book of the month, Last Child in the Woods: Saving Our Children from Nature-Deficit Disorder . I haven't read this book, although the theme resonates with me. It is so important for kids to just go outside with nothing planned, nothing on the agenda. Sometimes they need to get out the hose and make a mudpuddle. Sometimes they need to play rockets or whatever their hearts desire. If you want to join in, it is a twitter bookclub open to everyone. There is a wiki and guidelines for how it works (or how we think it will work.) Add your name to the list of participants and let's experiment. Wouldn't it be cool to actually take our kids out to freeplay and twitter what we observe to the bookgroup. OK, now, I've got to go clean the house! I've just downloaded my first book from Audible.com and am excited about making cleaning a little more pleasant. Indiana Jones' son "You're a teacher." (hat tip to basler on twitter) The romanticized part of me wants to think that there are a lot of us out here who teach and then do really exciting things on the side. And I could talk about that. But really, I'm just excited about a really cool movie! Actually, the Indiana Jones movies and Star Wars movies got me through college. When I would study for 18 hours a day, I would put these on my trusty VCR and play them in the background so I wouldn't have a pity party about having to study so much at Georgia Tech. I tell this to my students. Often, some of them, when they miss a paper or forget homework, they say, "I'll try." I've found that this is part of their excuse to not do something. "I'll try" usually means, "Mrs. Vicki, I'm saying this to get you off my back, I'll do it later when I feel like it." I use this with my students. My boys particularly respond to this from LouHoltz. It is a little long, but it is amazing. I feel the same way as Lou. I've had some horribly low points as well. I usually just use the first 3 minutes, the audio is a bit off after the initial opening clip. We discuss freedom and the importance of speaking out for what is right. I love that movie! The point of this movie is that Einstein explained simply a very complex formula in a 57 second movie clip. If my students and I who pursue academics cannot explain things simply to someone not in our field, then we are limiting our effectiveness. The art of communications is paramount and being able to communicate and simplify is often the mark of those who are pivotal in their field and indeed break out of their field to influence all humanity. 1) Youtube has some great resources. 2) Youtube has valid educational uses. 3) With a rating system (G, PG, PG-13) or even an E rating for education, we could allow this great resource through our filters and filter by rating, not completely blocking the site. Now, we have no choice and many of you have to go home to read this blog post because you cannot see the videos. 4) Humans are deeply influenced by video, particularly those with an emotional anchor in their past. I used a disparate listing of video in the hopes that each of us would find one video that really pulls at our heart. 5) The effective use of video can give us breakthrough moments with our students. I most often find that the use of video has the greatest impact on my student writing of anything. If I can get them emotionally engaged, I can teach the importance of voice. Although youtube is one of my most useful tools, it is also one which I curse under my breath several times a week because it requires my visual attention to the screen of my students if they get off task. Sometimes, I block youtube when it is a distraction and I just need to get my work done. But youtube could solve this problem -- they could allow people to self rate and then crowdsource the authenticity of those ratings. Right now, youtube has the most videos and as much as I'd love to use teachertube.com. However, copyright issues and issues such as these continue to plague them. Since they have been bought by Google, they have not shown the responsiveness to these issues. "You get What you Look For." And therein lies the problem with youtube, doesn't it? Speak out about your thoughts on youtube in education. Perhaps if enough edubloggers say something about it, they will begin to listen. I think that often once edubloggers talk about something that they feel that they've covered it. This is not true! Effective companies are perusing technorati and google to see what people are saying right now! So, edubloggers. What do you think we should do about youtube in education? The cupcake is a delicious thing! 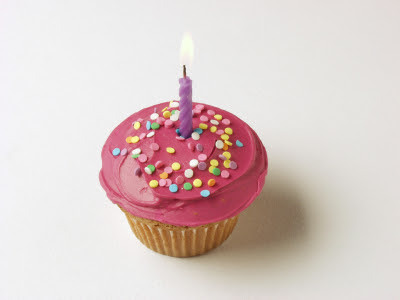 We all love cupcakes and our school parties are full of them! 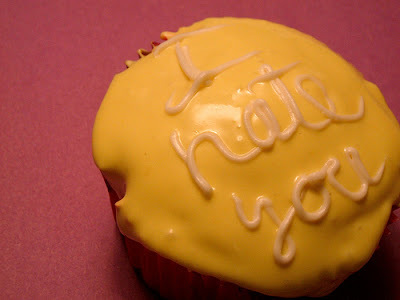 But what happens when someone gives a person they dislike a cupcake that looks like this? Or what happens when you eat too many cupcakes and end up like this? So, really, what we're saying is that we should BAN CUPCAKES! They make us fat, they hurt people's feelings! They are terrible, awful things -- aren't they? Well, we see cupcakes for what they are... an object in the use of humankind. And as with all objects, they can be used for good or for bad. There are lots of other objects like these running around in schools... scissors (they can kill people), pens or pencils (also could kill someone), and the most lethal thing ever invented: human beings! Human beings are all over our schools, and yet, as we are reminded this week, they kill more other humans than anything else! But yet, we don't ban humans, we put things in place and teach the behavior so that we will not be eye poking, cupcake hurting, scissor wielding, fanatics. We don't focus on things like cupcakes and scissors, because the human race tends to focus on the new things as the source of their ire. When the Gutenberg press was invented, we had book burnings. When the Library at Alexandria amassed the amazing learnings, it was burned also. Chemists were witches as were astronomers and many other scientists. These are the things that we're looking to outright ban rather than teach their proper use. "Many great authors were once banned." She and I often joke about how I write a blog to people who CANNOT read it. The teachers who read my blog have to slink home after a long day at work, open up their laptops and read my blog and the blogs of other educators promoting change. I am banned. If you blog, you're banned too. But, I feel that the tide is beginning to turn and I believe it is because of the increasing cacophony of voices. This past Tuesday, I had an amazing time at the Center for Quality Teaching and Learning at Columbus State University presenting a workshop. (See my notes.) Their visionary director Beth Holmes and I had a delightful dinner talking about change, the balance between testing and creativity, and she taught me a lot! Beth Kanter spoke about the amazing fundraising potential for schools and nonprofits using facebook and myspace as well as the state of technology education in Cambodia. Although we all spoke about different topics, one theme emerged. It was through our combined voices that the chorus for change emerged as such a cacophony that it could not be ignored... even for me, it was powerful to hear the similarities of speakers who did not even know the others were coming in or the topic of their talks. I'm sorry. You can call me a hopeless romantic, but I see the parallels with what we're experiencing right now in education that are so profound! I can barely express how important I believe it is that we sing together. That we echo the importance of protecting our children from what is harmful, while exposing them and teaching them to the things that they need for their very future and the future of any nation that wishes to be civilized. A commitment to excellence and high achievement that does not only produce well educated students but ones who are articulate, wise thinkers who can create and innovate. That can generate ideas and inventions with the wisdom to effectively implement ideas for the good of society. People who interact online but remember that there are people behind the blogs, videos, podcasts, and avatars that they encounter. Pardon me for being passionate, but I'm passionate about this! The youtube clip that I included had all of those who had been in the Les Miserables musical over the 10 years. Those people earned the right to sing that finale in the anniversary because they had served their time! When this chapter of history is written. When nations decline or improve because of the impact of their educators in their respective decisions and efforts, will you have earned the right to sing in the finale? Will you be a person who has promoted positive, wise, change? Who advocated the effective use of technology, not for the technology itself, but for the end result of well-educated students? These are tough times, and pardon the pun -- some of us can get pretty miserable at times. However, to earn the right to sing of victory when we're done, we must put in our time now. We must run and not grow weary and walk and not faint. We must encourage each other. We must experiment and only take those technologies to the classroom that are safe for our students. We must be more dedicated to excellence than ever. Only time will show whether we are visionaries or quacks, saints or devils, wise or foolish. And, as I've often said before, sometimes how we do things is the deciding factor. In these days we desperately need visionaries and a whole lot of elbow grease. Doing it right takes a lot of effort. Photos are from iStockPhoto and all rights are with existing photographers. If you wish to use these photographs, you must purchase the license from the original photographers there. My friend Lucy Gray sent me information on this great program! It is Doodle 4 Google and your school has 6 submissions that they may submit to Google. (So it means you need to have a school competition.) It is open to grades K-12 and they have made lesson plans to help you (Grades K - 3, Grades 4 - 6, Grades 7 - 9, Grades 10 - 12). First, you must register and get your 6 ID numbers from Google. (Only 6 per school!) Then, download the lesson plans and the flyer (to post on your door.) The doodles will be judged in 10 regions to get 400 state winners and eventually will narrow down to one national winner which will go live on the Google homepage for 24 hours. It's called Doodle 4 Google, and it offers students all over the country the chance to design the Google logo, and perhaps have their artwork viewed by people all over the world. - What if...I could live underwater, or in outer space, or in Colonial America? - What if...I could see into the future? - What if...I could build any kind of invention I wanted? But your students are encouraged to come up with their own ideas about this theme. The competition is open to K-12 students between 5 and 18. An expert panel will pick 40 finalists who'll be invited to a workshop with Google's official doodler, Dennis Hwang, at the Googleplex in Mountain View, California. The U.S. public will vote for their favorites, and the winning design will replace the regular Google homepage on May 22, 2008. This champion doodler will receive a $10,000 college scholarship and his or her school will receive a $25,000 technology grant. Please visit www.google.com/doodle4google. You'll find all the dates and resources you'll need to get your school involved, including detailed lesson plans to help incorporate the competition into your curricula. School registration closes on March 28th and doodle entries must be received by April 12th, 2008.